How do you play Marziano's game? Re: How do you play Marziano's game? So what could be the connection of Marziano to the later tarot of Florence 1440, the CY and so forth? ...It is true that virtus in Latin does not have the same moral connotation as virtù usually does in Italian: in Latin it means “strength” or “excellence” as well as “virtue” in the moral sense. Each god or demigod has his or her excellence, which does not always translate to moral excellence. But that is the problem. It is virtue in the moral and theological sense, action in accordance with divine will, that Marziano is promising to “arouse” in Filippo - he explicitly says, in a sentence I have omitted, that his concern is the virtue of "moral actions", "actibus moralis" - and it is that which is now mixed up with vice. Yep, manly virtus is not the theme but rather the moral theme of virtù. The source behind Marziano, as Ross has pointed out is Boccaccio, who in turn was often filtering Petrarch through his own lens (and all of this ultimately relies on the then-recent Ovide moralise tradition). Petrarch was obsessed with viewing his Laura (if she in fact existed) as Daphne. Daphne, humanity at its most vulnerable chased by the passion of a god (and besides Apollo you could have of course inserted any number of Jupiter's objects of desire, but the choice of Daphne clearly points to Petrarch), and she is at the bottom of the list with Cupid - as the lowest level where human-"celestial" interact - for a reason: human virtue struggles amidst the chaotic stirrings of the gods, some of whom are virtuous (e.g.,Minerva) some of whom are most definitely not (e.g. Bacchus). The "self" thrown into this realm of virtues and vices was increasingly common since the 13th century. In BL Harley 3244 ff. 27v-28 (1238) below, it shows the seven vices represented as devils: Superbia (Pride), Invidia (Envy), Ira (Wrath), Accidia (Sloth), Avaricia (Covetousness), Gula (Gluttony), and Luxuria (Self-indulgence), each subdivided, and countered by doves representing the seven gifts of the Holy Spirit, a knight on horseback (the 'Just Man') with the shield of faith and armed with virtues, and an angel. 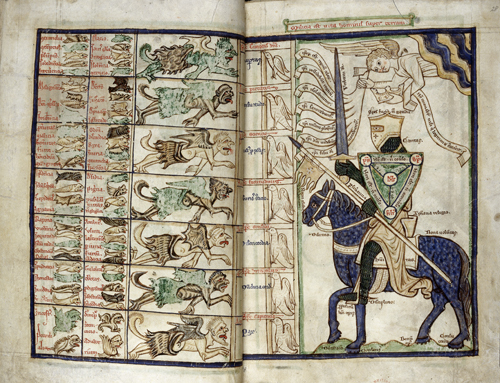 The armor of the knight and the trappings of the horse are labelled with the names of virtues. Then Latino wanders from his path - as Natura had warned him not to do - and comes to the realm of Fortune and Love, as he travels down the lefthand road on the Kalends of May . There he finds a variable landscape that at one moment is deserted, the next has tents, then palaces, in which people are weeping or joyous, in which they are stationary or are chasing or being chased. He sees the god Amor with his bow and arrows upon a pillar, and is fearful. But he turns to the great Ovid, who teaches him by means of his verses both the delights and the errors of love. Ovid gives Latino mastery over himself, protecting him from the arrows of Love and allowing him to flee from that dangerous place (Strozz. 146, fol. 21v). A Milanese variation of that theme: De Predis depiction of that planetary "children's" realm of Amor for Sforza in his c. 1450s De Sphaera (Ms. lat. 209 Biblioteca Estense, Modena). Dante of course has Virgil guide him through the dangerous realms before being handed off to Beatrice to ascend through the seven canonical Virtues/planetary spheres before arriving at the top spheres for the heavenly visions of the divine. It these seven virtues I argue we find in the CY (with temperance and justice missing, but found in in the PMB and thus assumed as missing in the CY, with Prudence more controversially proposed as "World"; more on the latter below). 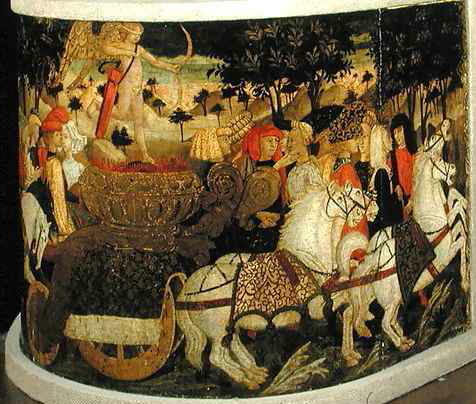 As for Mike's question about the "connection of Marziano to the later tarot of Florence 1440, the CY" - in the CY "world" what is this knight and the kneeling maiden he is to cross the river for, but precisely the woman holding Chasity's shield on the "Chariot" and the virtuous "Chavaliero" from the Trecento sources (or any of the Arthurian legends so popular in Milan and Ferrara), both having successfully followed the path of he virtues (and their exemplary themes) found in the preceding cards, with the knight now able to claim his maiden (being received by virtuous monks upon a boat). The Quattrocento added the detail of the fama of a ruler's virtues, almost always with the additional line of "singing their praises to the stars" (astrology being an utmost concern, allusions to it are found everywhere, not to mention the stars are eternal, thus the ruler's fame). So in addition to the symbols of rulership of the allegorical bust protruding from the band of clouds (I would think it as an updated version of Siena's "good government" fresco or in the case of Visconti, rather the "the well ordered dominion, ruled with 'good right") we find the winged trumpet of fame...the fame of both virtuous Bianca and Francesco. And the Florentine ur-tarot would not have shown a couple but rather the "Kalends of May" theme (and its social rituals that bound Florence, ergo the CVI love trump - and compare the front couple of the CVI to the couple underneath the springtime zodiacal sign of Taurus in the Venus Sphaera page above, with a lute player facing them, suggesting they are dancing). The group versus couple Love motif has a Trecento provenance. In fact, Amor paired with a ruler-couple may be a Quattrocento innovation, as the Trencento - the age of the communes - seemed to have preferred a theme that suggested society at large. This is the continuation of what I wrote at viewtopic.php?p=20726#p20726. Thanks, Phaeded. The only thing I have problems with is inferring the make-up an "ur-tarot" card (Love) from a card that is at least around 1460, plus a selected set of images showing bunches of lovers. There are also lots of images of Petrarch and Laura as a couple, often with a Cupid thrown in, with an arrow through Petrarch's heart or aimed at it. I would guess that the early Florentine was the popular tarot, not a set of hand-painted cards, so it might well be close to the Rosenwald,, a man kneeling in front of a woman. http://tarotwheel.net/history/the%20ind ... amore.html, or what we see in the Budapest, for which see the same web-page. And thanks for the illustration of Fortune and her Wheel, Ross. I assume that is an earlier version of you below her. Now we do have a virtue in every row. I did not expect this result! I still don't know what Temperance has to do with Faith, or Fortitude with Charity, except in a general way, but the other assignments make a kind of sense. Another order for the CY cards is provided by the Beinecke Library's captions (https://brbl-dl.library.yale.edu/vufind ... t&type=tag, click on cards to see captions), in the order it presents them. It is quite mysterious where these captions came from. The curator of the collection has affirmed repeatedly to me in emails, most recently in 2018, that they came with the cards when Yale acquired them, but he has no further information. It is true that we don't know if this set of captions goes back to the date of origin of the Cary-Yale, or even as far back as any of the known orders. It is at least something, and after I have presented it I will give a few reasons, admittedly not decisive, for thinking that this order is indeed original. From the above, I can see three reasons, maybe four, for thinking that the Beinecke captions were part of the original conception of the game. One is that nobody between Marziano and Moakley (1966) ever mentioned associating triumphs with suits. Durrieu in 1895 and 1911, mentioned the 16 cards in 4 categories, but no suits (Durrieu 1911 is online, p. 376 at https://www.persee.fr/doc/minf_0398-360 ... _38_2_1596). A cataloger would have had to have been highly original to have made suit assignments, and they are not known for that attribute. Another reason is in the cards themselves. As Huck has pointed out (http://a-tarot.eu/pdf/cy-jpg.jpg, revising and illustrating his 2003 "It's a 5x16 deck" at http://trionfi.com/0/c/30), certain details are analogous to the layout of the pieces on a chessboard. Queen and King form one pair in the center, and we see the Empress and Emperor in the first row above. On the ends are the rooks, which look like towers. Both the World card, with its female Fame, and the Judgment card, with Michael and Gabriel, in the bottom row, have towers. Next to the rooks are the knights, which look like horses. Both the Chariot, with its female rider, and the Death card, male-looking, have horses. What corresponds to the bishops is problematic. The Italian name for them translates as "standard bearer," which at least fits the suit-sign of Batons. But the correspondences work for 3 out of 4 rows. A third reason has to do with the placement of the virtues. If we are seeing a 4x4 matrix with blanks that are not filled in, then at least there is room for a virtue in each row. 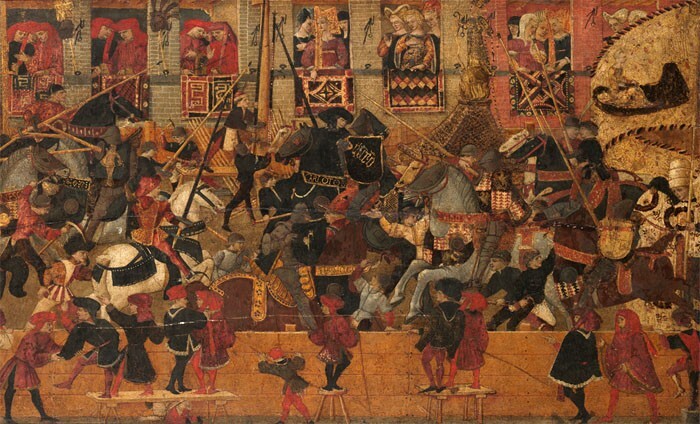 Moreover, the association between Fortitude and Batons receives some confirmation from Ringhieri’s game and the Visconti funeral oration, if what is said there can be extended, as seems reasonable, from "columns" to Batons and Fortitude. In that case the assignments would be at least as old as the tradition, i.e. between 1402 and 1550. Batons: 5 Fortitude, 6 Fortune, 7 Faith, 8 Hope. These placements assume that Fortune is indeed one of the missing cards and that it goes in the second row. I cannot think of any other card, except the Old Man that could possibly go in the second row, or anything other than a celestial or maybe the Vecchio in the fourth row. I am also assuming that the row Faith-Hope-Charity is not interrupted somewhere by Prudence, as in Minchiate, and, although it doesn't make any difference, that Prudence is next to Temperance, paralleling Fortitude next to Justice.. In this case the hierarchical order is not by columns, as in Marziano's case and the Minchiate-derived A orders, but by rows. To have the internal hierarachy go by columns would produce an order foreign to any later order of triumphs. But it will still be possible to play the game of virtue, as long as the triumphs are included in "following suit." There is a certain logic to the rows. Prudence, i.e. looking to the past to guide the future in the present, naturally goes with Time, including thinking of the fate of one’s soul after death. Temperance in food and drink can stave off death and leave what would have been spent on pleasure for Charity. Both it and Chastity (Chariot) help one to look beyond this world and so defeat the power of Death. Fortitude is needed to withstand Fortune and keep Hope and Faith alive. Justice is the virtue of rulers, and also governs the marriage contract signified by the couple’s handshake on the Love card. We cannot leave out the Ferrara region, the only one to put Justice high in the order. Here the earliest list is in the Sermones de Ludo order. How can it have one virtue in each of four rows. Strictly speaking, it will be impossible, because there is no Prudence card. But perhaps something else substituted for it. There are several rather vicious characters in the 22, such as the Hanged Man and the Devil, neither of whom should be allowed to triumph over anything in a game of virtue. Judging from Andrea's analysis of the Fool card, it, too is a vicious card, at least when placed low in the sequence, and the same for the Bagatto. Et pareggia ciascuno alla bilanza. And makes everybody equal on the scales. If the theologicals were before Death, it would make no difference to the placement of the virtues. In a Beinecke-inspired order, there is one other variable, namely the placement of Time. It works in the second row, but what about in the fourth? Allegorically, Time as the Sun, as a symbol for God, could be associated with Swords as His Justice. However, Time as Old Man as Fortitude, ie. Endurance, is less of a stretch. It might be wondered whether the game could be played if the order went by columns instead of rows. It is not necessary to construct the matrix. The 4x4 matrix will be the same as the above, but with virtues governing columns instead of rows. The answer is that we clearly cannot. In B2 there is no cardinal virtue in the last column and two in the third. In B3 there are three virtues in the third row and none in the second and fourth. Allegorically the B lists differ from the Beinecke’s in that Cups governs the first row and Swords the last. Allegorically Cups as Temperance suits all four of the cards, urging moderation and self-control among rulers and lovers alike. In Swords it is easy to see how Justice dominates the Last Judgment and also the World, provided the latter is seen as “God the Father,” as the Sermones tells us, rather than Fame. An interesting feature of the B reconstruction (and even if the only reconstruction is of the Hanged Man) is that the suits are in the same order as they are for Marziano, if we grant Pratesi's subsitutions, i.e. 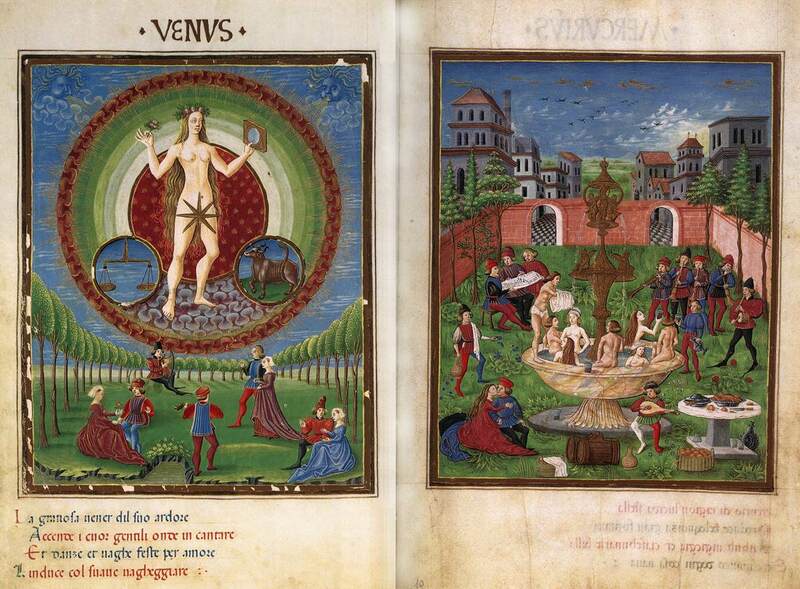 the lowest is Pleasures = Cups, then Continences = Batons, then Riches = Coins, and most powerful Virtues = Swords (see again his "The earliest tarot pack known", online in trionfi.com). Moreover it is the same order of virtues, once Prudence is removed, as we see in all the A orders, taking them as part of the hierarchy of triumphs as opposed to their order in the rows. It is that of Plato in the Republic, with Temperance governing the appetites and the people, Fortitude the "spirited" part and the warriors, and Justice the whole, as determined by the rational part and the guardians. Where Prudence should go, whether at the top or in third rank, is unclear from Plato. On the one hand, he presents it (as Wisdom) third, with Justice following as pertaining to the whole; on the other hand, it is the highest part of the soul, and that which determines what is just, so could arguably be highest. Cicero and Aquinas both made it highest. In Ferrara, as in Marziano, Prudence is in third position, with Justice high. In Bologna (see top of this post), it is in the top row, and otherwise follows Marziano precisely. I conclude that B2, of Ferrara, is the closest to Marziano by one standard, and A4, Bologna, by almost two standards. Minchiate in another reduction, A2, will also work, although it is not as strong as the first two, as will that derived from the Beinecke order, C2, even less close. Yet the cards for these imagined decks are deduced from C1, the same deck as the somewhat reconstructed C2. I will try to make sense of this. First, this conclusion is not about where the tarot was invented. It is only about what is closest to Marziano. For all we know, the subjects for the intermediary game, which I like to call the ludus virtutis, were already in existence before the game of deified heroes, at least some of them, somewhere else, in a game or games whose order and rules are beyond speculation. Second, even if Ferrara and Bologna are the most promising, that does not mean that Ferrara or Bologna would have had that order before anyone else. It might have existed several places, including Milan, with Ferrara or Bologna as the only places that kept it. After all Marziano was in Milan and knew the preceding game best. Against this, there is the unsurveyed but known copy of his treatise to bear in mind. For the Cary-Yale, Filippo then would have deliberately changed the order to suit his purposes. For example, he may have wanted to emphasize that rulers, including the ruling part of people's own souls, should associate themselves with Justice, and that Justice is what governs the marriage contract more than temperance: that is to say, what is important is that the two parties fulfill their obligations to each other and to God, at least to the best of their ability. As for the Florentines, in that case they would have had the cards and the rules in an order such as A4, perhaps with a rule about the necessity of "following suit" with the associated triumphs. But they would have thought that it made more sense, and made for a more enjoyable game, to detach the hierarchy of triumphs from the suits altogether. They also decided that a game would be more popular if the theological virtues were removed and other cards added, including some vicious but fun ones like the Fool, the Bagatto, the Devil, and so on. This type of game, the ludus triumphorum rather than the ludis virtutis, would have proved vastly more popular and have quickly dominated the market. In the other centers, it would have been no problem to add cards, as most of the other cards were in much the same order everywhere. The only ones that weren't were the virtues. If the Florentines were responsible for a major change in the game, they probably would have received the game from somewhere else (unless it was present already in a very small milieu, say one family), and that sometime late, because otherwise we would be hearing about the game long before 1440. There need not to have been a specific event triggering the change. Dummett in 2004 (“Where do the virtues go?” The Playing Card 32:4 (2004), pp. 165-167, online at viewtopic.php?t=1073) proposed that the reason the virtues, unlike the rest of the cards, were in such different places in the three main orders, was that the deck at an early stage had no virtue cards at all, and that when they were added people knew what they were but not where they went. I say in reply that surely they could have found out easily enough. It seems more likely that they were in different positions by design, in an earlier stage, and not of 18 triumphs but of 16, in which B2 is changed to Filippo's C2 in Milan and one serving greater commercial potential in Florence. Such a game would not have lasted very long, given the new game out of Florence. But it does suggest that in order to have a 5x14 deck, whoever controlled the deck in Ferrara or Milan would have invented 5 new cards that persisted: Fool, Bagatella, Popess, Pope, and Hanged Man. There was also a new Fame (i.e. the modified Justice), but that did not persist. Then, when the virtues were put back in, they would have gone in their customary places, as in the Cary-Yale. To sum up, I am hypothesizing that the game called ludus triumphorum developed in incremental stages. The idea of trumps comes from Karnoffel, but it uses the regular deck. That there is a permanent trump suit begins with "VIII Imperadori", but still very attached to the regular suits, an extra two cards per suit that also form a hierarchy among themselves. A more complex notion is that of Marziano, where the extra cards per suit are in the nature of divine beings, yet sharing some affinity symbolically with four species of birds. In what I call the ludus virtutis what changes is the subject-matter, now a game of virtue, but with the same rules as before. It is not a very popular game, but since it is played mostly in the courts, probably in a family context, or by just one or two families, nobody cares. Finally Florence develops the ludus triumphorum in all its glory and popularity, starting in the late 1430s, to which it may have added cards up to around 1450. The other game goes extinct, and today all that remains is the different placements of the virtues in the three regions, of which the Bolognese and Ferrarese orders are the examples closest to Marziano, neither of which is the original form, whose cards are those of the Cary-Yale. The on-line Latin side-by-side with Ross's English translation: Gasparino da Bergamo, detto Barzizza.Funebris oratio. In mortem cuiusdam Doctoris edita. What strikes me as especially odd about Marziano's description of the gods is the epithet "celestials." Clearly there could be the Manilius link of at least 12 of the gods as tutelary deities over the zodiac, with perhaps the remaining four standing in as signs for the sublunar four elements (or just the sublunar past-time of love)? We are sending away the father of city and the protector of our civic patrons. We are sending away a man most erudite in all the good arts and the most upstanding disciplines. Finally, we are sending away one in whom thrived the greatest humanity, in whom there was unique outstanding fairness, courage of spirit, admirable constance, the highest counsel and a certain divine wisdom in foreseeing great things. But given the Visconti obsession with eclipses and astrology in general, how is that "divine wisdom" not precisely astrology? Ergo, the "celestial" aspect of his game has to do with some form of astrology, no? Caveat: the Latin for "divine wisdom" is providendis sapientia, which might otherwise be translated as "prudent wisdom" (http://www.memidex.com/providence+prudence), Not that something like the "prudent counseling of the stars" (numerous examples of similar phrases abound in the 15th century) couldn't be called "prudent wisdom" but we are making a maximalist reading here. Indeed, "prudence" rears its head elsewhere in the text, where Marziano showed "incredible prudence in debating and wisdom in giving his opinion in the senate" (incredibilem in deliberando prudentiam in sententiis...). And yet we are left to explain "celestial" in the deck's description and besides Marziano's general "sapientia" he is specifically been said to able to foresee the future. I'll end these remarks with a relevant motto from a contemporary humanist-ruler: Vir Sapiens dominabitur astris - "The wise man shall have dominion over the stars"
These were taken on a visit to Angera in 2008. The second one with me in front is to show the scale and aspect. The staircase was (probably?) not there when the room was frescoed in the 14th century. I was there in 2011 and my pix of the Wheel came out blurred unfortunately (and what a beautiful castle/lake - for anyone visiting Lago Maggiore, an easy day trip via train from Milan, definitely hit the Borromean "Isola Bella" even though unrelated to tarot - might be the prettiest spot in Italy). Any chance there are b/w photos of the fresco, perhaps when in a better state? Judging from some of the photos - I haven't checked all of them - there has actually been restoration since 1912. Look at the window in Saturn; in Toesca (p. 158) there appears damage, nowadays it is fixed. I got a little tourist book at the gift shop, Angera Fortress, Historical-artistic Guide (Amministrazione Borromeo, 2000), which provides basic information and bibliography. I was mistaken about the date - it is actually 13th century, after 1277. The phrases still legible come from notes by Roberto Anglico on Sacrobosco's De Sphaera from shortly after 1271. The life of Ottone seems to faithfully follow the order of events and the themes of Stefanardo da Vimercate, Liber de gestis in civitate Mediolani. Many copies of this are online, but I can't seem to access any at the moment (it's alright, I saved a copy years ago). I don't think it has been translated, even into Italian. The life of Ottone seems to faithfully follow the order of events and the themes of Stefanardo da Vimercate, Liber de gestis in civitate Mediolani. Many copies of this are online, but I can't seem to access any at the moment (it's alright, I saved a copy years ago). I don't think it has been translated, even into Italian. First of all thanks for the Toesca link - what a great resource. And yes looks like we'd need drawings from earlier centuries instead of photos to see any more details. Too bad. This work has been broached here before, but there is a decent critical discussion of Vimercate/Angera frescoes in Anne Dunlop's Painted Palaces: The Rise of Secular Art in Early Renaissance Italy (2009: 166-178) ; chunks of Vimercate translated and Toesca is cited/discussed. Google only has a few scans of this section, but I've got a copy if there is anything you'd like me to look up. After the recent polar vortex experience here in Chitown I'm pining away for a revisit to Angera. I happened to be there on a sunny, unseasonably warm day in early April (sometime around Easter) with wisteria blooming everywhere around the shore towns, the Alps in the distance across the lake...well, as you experienced, its a beautiful place. Really surprised there aren't more signs of continual habitation by elites in the Angera castle, but thank gawd those frescos weren't plastered over with the likes of Vasari-era crap (sorry, but for example, the Ferrara - minus Schifanoia [hardly anyone in there!] - and Mantua palaces really disappointed me because almost all of the Trecento and Quattrocento frescoes have been replaced by those of the 16-18th centuries; especially the Doge's palace....). 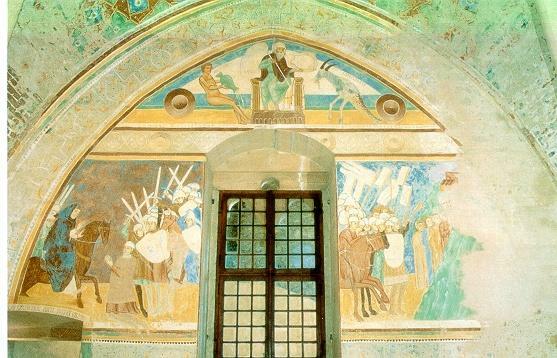 Highly recommend the Trinci frescoes in Foligno if you ever get a chance (easy day trip from Assisi, and no one else will be in there); I consider those the next best, earliest surviving frescoes after Angera, and of special interest since associated with an upstart condottiero. What strikes me as especially odd about Marziano's description of the gods is the epithet "celestials." Clearly there could be the Manilius link of at least 12 of the gods as tutelary deities over the zodiac, with perhaps the remaining four standing in as signs for the sublunar four elements ...? Let's assume Marziano had an early look at Manilius after Poggio's 1417 find, or at least an description of the novel arrangement of the zodiac and gods, and that both Marziano and the Ferrara Schifanoia hall of the months share the same source for the 12 Olympians of Marziano's heroes...why it is the one deviation Bacchus replacing Vulcan by Marziano? Especially if there were no intervening years in which for other humanists' interpretations to adhere to Manilius, why would Marziano immediately alter a Roman text? Bacchus was a natural replacement because it was him who coaxed a brooding Vulcan back to Olympus after getting him drunk, a famous theme called "the return of Hephaestus/Vulcan" celebrated in plays and on Attic pottery imported into Etruria, etc. Whence the zodiac in Marziano? There is no indication of the zodiac as such, but the one "hero" that is described with stars (apparently a catasterim after the King of Athens died), Jupiter, is described as if at least part of a constellation: "Four stars appearing above, attend him... On the lower right side appears a burning star like Mars." Manilius assigns Leo to Jupiter, and the head of Leo, that which is above, is formed of four stars: mu Leonis, kappa Leonis, lambda Leonis, and epsilon Leonis (see constellation diagram here: https://en.wikipedia.org/wiki/Leo_(cons ... eo_IAU.svg. In respect to the overall lion outline, lowest and furthest to the right is the only magnitude one star in the constellation, Regulus, designated alpha leonis. As for the epithet "like Mars", note that Ovid sometimes referred to it as Violentus Leo, something befitting the God of War, hence the equivalence. That Marziano made this astral link with just the first hero was likely to take the lead god and indicate the linkage between his scheme and the zodiac; but too much astrological verbiage would be required to do this for each card's pictorial description. The point of showing the post-Marziano example of a calendar zodiac is that it was enduring, and not simply a backwards look at an obsolete medieval tradition. The Wheel of Fortune was not usually linked to the zodiac, but in an age of increasing astrological obsession, the linkage could not be considered an oddity considering both the stars and the Wheel both connote fate. At some level it seems that Marziano has updated the Angera fresco cycle in light of the most recent fruits of humanist rediscovery (i.e., Ovid through the texts of Petrarch and Boccaccio) . Marziano's abstracting the twelve zodiacal signs to the tutelary gods behind each allows one to contemplate the inherent virtues and vices one might continue in the round of the year - this is truly a "modern" humanist touch. 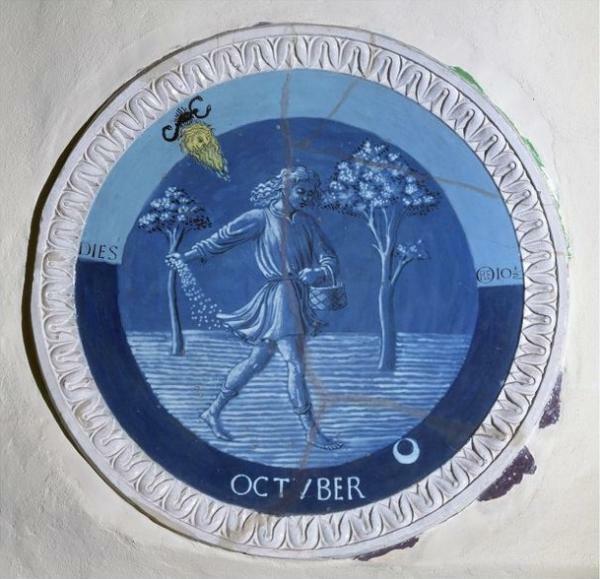 Going back to our earlier discussion of the the zodiacal cycle in Angera (albeit the tutelary gods are planetary there and do not derive from Manilius), that planetary/zodiacal scheme is juxtaposed - or rather complemented - at the other end of the hall with the Wheel of Fortune. So beyond getting lost in the description of each hero there is the ultimate concern cyclical time embodied in the zodiac, with each sign of extrapolated instead in terms of whether a virtuous or venal god is behind it. So we have two reasonable elemental candidates, Aeolos/Air and Cupid/Fire, but Daphne and Hercules (the latter who becomes an Olympian but lives his life wholly on earth), look like hopeless dead ends. But I'll continue to insist Ovid is at the heart of this assembly of heroes and that we look to him for the missing elements of Water and Earth, as nonsensical as it would seem for those two unrelated figures. have virtue! Cover me, O mother Earth! in the close covert of a hollow rock. “Was it you, Lichas, brought this fatal gift? into the waves of the Euboic Sea. through fear, his blood was curdled in his veins. and they have called it Lichas ever since. upon the careless limbs of Hercules. immortal, cannot feel the power of death. It is not subject to the poison-heat. and purified, to our celestial shore. to all the Deities surrounding me. The pre-Socratic philosopher and mystic, Empedocles, famously followed in Hercules' steps to prove he was immortal by throwing himself into the cauldron-like caldera of Mount Etna, so literally dies "in" the earth, but becomes immortal (according to his cult). discordant concord is the means of life. and what the art may raise humanity? No such dour histrionics from Marziano - he's merely invented a clever diversion...for a son of Venus, ready to be aroused to virtue. If none of the above, but you allow the possibility of Manilius, why an extra four heroes? Just to fill in a 14 card suit? But Marziano hasn't suggested 14 card suits - just a king over pips. Just in case you are still here, please do send the relevant pages of Dunlop. Our trips to Milan were both in August, so we know the heat. Angera the town was virtually deserted, and only two or three other tourists were at the castle. Essentially we had the place to ourselves. The little-known "tarot tours" kind of visits, to places like Clusone and Brunate, and Sant'Alosio, are worth the effort. Even Pavia does not bring many tourists in August; it is hard to get something from a visit to the castle unless you are looking for something, because you've studied the history. I wish I had spent more time in Tortona, looking for Marziano's gravestone in the church in the center of town (not sure of the name). Even though all of them have been renovated, they often move the stones carefully to a visible place. It's not like some revolution, or Protestant destruction like in southern France, has vandalized them beyond recognition. I was astonished to find the gravestone of Marziano's nephew, Enrico Rampini, in San Clemente in Rome. I didn't know anything about him at the time, but I read it myself and recognized "Sancto de Allosio (sic)" in the inscription. I had to look it up to be sure - he was a Cardinal. It is good to have a thread to follow when a tourist.